Home > Traditions and History > Why Do We Give Christmas Cards? If there’s one thing that lets us know the Christmas season is upon us, it’s Christmas cards. As early as October the shops start stocking Christmas cards. And they’re available in every different shape, size and theme you can imagine! They have even been adapted to fit the changing face of our society with cards for step-parents, half-siblings and more. Christmas cards have been a Christmas tradition for over a century. It was in 1843 when Sir Henry Cole commissioned a card with a picture of a family with a small child drinking wine together. The card was illustrated by John Calcott Horsley. The idea was controversial, as was the picture, but Cole made a batch of 1000 cards and every one was sold – for a shilling each. And so the tradition of giving Christmas cards was born. Christmas cards are available in various themes from religious to cute and funny to artistic. Surprisingly - early Christmas cards were very rarely based on religious themes. It is said the designs, which featured flowers and bright colours, were intended to help the recipient celebrate the oncoming spring season after a long, cold winter. Humorous cards were also popular before religious types. The first printer of cards in America was Louis Prang in 1875. His cards were expensive though and soon other companies began offering cheaper cards. The competition was too much for Prang and his company went bust. In the 1840’s Queen Victoria produced the first official Royal card. Since then the Royal family has produced a Christmas card every year, as has the Prime Minister. They usually feature a photograph of the family in a seasonal setting. The first President to issue a Christmas card was President Dwight D. Eisenhower in 1953. The developments in technology mean the ways of sending Christmas cards have greatly expanded, so much so that you don’t even have to have a card at all! E-cards are digital cards, which are sent through email. They can be personalised and pop open when the recipient opens the email. 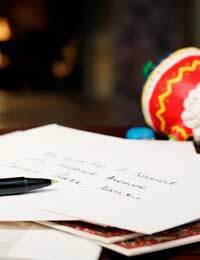 However, despite the advances in technology, it seems the tradition of sending Christmas cards the old fashioned way is not going to die out just yet. Last year over a billion Christmas cards were sent! Ever heard the saying “you’re off my Christmas card list”? Hopefully you haven’t, at least not directed at you! The Christmas card list is simply the list of people a person is planning on sending a card to. But with Christmas cards as popular as they are it has now come to represent a person’s network. Being struck off a Christmas list is considered the ultimate snub - so make sure you check to see you’ve not accidentally left anyone off this year! With the huge number of Christmas cards we send and receive each year comes a downside. Once the Christmas season is over the cards are thrown away and wasted. Thankfully there are now plenty of recycling schemes on offer whereby you drop your cards off at a selected store and they are sent away to be recycled, helping you get your new year off to a greener start! TIP:For a fun task why not make your own Christmas cards with your kids. You can make them in any style you like, with cards from previous years and relatives will love the personal touch.